Oberengstringen (CH), 12 February 2015: IML has arrived in North America. IML, introduced in Europe more than 25 years ago, is currently gaining in significance in North America. Reason enough for Beck Automation to take up this trend. 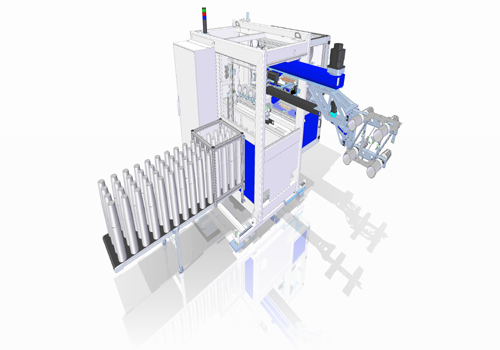 Beck Automation will be presenting the highly dynamic IML system B4 on the stand of the KraussMaffei Group (West Building, Stand 903 W) at the NPE 2015 in Orlando (USA). The turnkey production cell consists of a Netstal ELION 3200-2900 all-electric injection molding machine and a 4-cavity injection mold from Glaroform. The object is a stadium cup (44 oz cup with a wall thickness of 0.86 mm) frequently encountered in the USA in football, baseball or soccer stadia. The reference product comes from the Churchill Container Company (Shawnee, Kansas (USA)). The secret behind the IML automation is a concept developed by Beck (patent pending) that allows a reduced opening stroke to be used on the injection molding machine. The B4 IML system from Beck Automation is regarded as a reference with respect to productivity, speed, footprint, availability, and process reliability. “Performance is the key word in IML automation. The key elements are investment costs in relation to the life cycle costs. Productivity and reduced scrap rates, long operating intervals and life cycle times play a major role here for cost-effective operation of the IML system. The B4 IML system with the new “in-line concept” (patent pending) with reduced opening stroke on the injection molding machine offers a significant economic boost. IML is one of the emerging decoration trends in the packaging industry in North America. IML, introduced in Europe more than 25 years ago, is currently gaining in significance in North America, because IML offers a visually attractive “look” for numerous food applications, such as cups or foodstuffs containers. Nick Lewis: “IML is pure attractiveness. It is taking the packaging scene by storm here. The stadium cup on show is a very typical example of a food application. 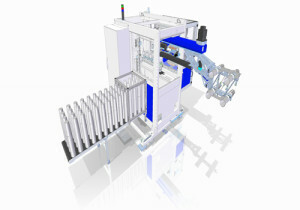 In view of the large numbers in the USA, the 4-cavity system being shown is very interesting for the whole of North America due to its reliability and productivity.” The B4 IML system is also user-friendly when it comes to product changes: The machine is very flexible and quick to convert for cups in sizes from 12oz to 32oz to 44oz. 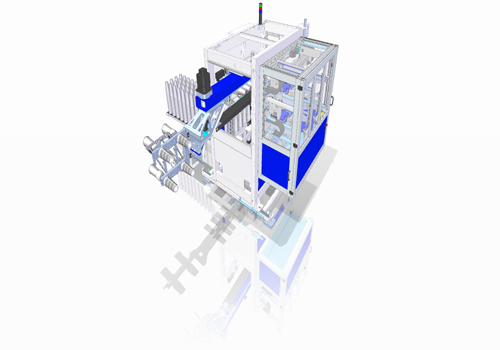 Beck Automation is presenting an innovative IML system at the NPE 2015 for the first time that requires a reduced opening stroke of the injection molding machine. The key to the system is a dynamic modification of the kinematics from a 2+2 product arrangement to 4-cavity in-line. The method of operation of the “in-line principle” (patent pending) can be described as follows: The finished cups are taken from the mold in 2+2 pairs while the labels are being placed into the other mold half at the same time. At the moment the IML cores have fully entered the mold, the finished cups are rearranged into a 1×4 line on the removal side between the two mold halves. In the next cycle the IML cores are again retracted from the mold and the main shaft out of the mold area back into the IML system. IML expert Nick Lewis is at the “front-end” for Beck Automation and Glaroform in North America. Beck Automation provides support for clarifications, concept proposals, quotations or financing solutions. Technical service such as for installation, maintenance or prevention is provided from Switzerland. All systems from Beck Automation are fitted as standard with remote diagnostics capabilities. In combination with the 24/7 availability of the service technician, this allows very short reaction times to be guaranteed. Beck has announced the establishment of a new service organization in North America for 2016. Certain components have already been “Americanized” to enable faster reactions. For example, the servo motors come from the U.S. manufacturer Kollmorgen in Radford (Virginia). IML Étiquettes/IML Labels give the stadium cup its elegant appearance. The labels used are made from a white 70 µ multilayer polypropylene film, printed and punched by IML Étiquettes/IML Labels, St. Eustache (Quebec, Canada). Although it is also common to use labels with a smooth surface, the “orange peel” effect is probably the most attractive characteristic of an IML application. In order to achieve this effect, IML Étiquettes/IML Labels use a “hollow” BOPP film. Structured like a sponge, the film breaks open during injection molding and changes its surface structure. It creates a brilliant visual effect that further enhances the print. Photo-realistic images, such as of fresh fruit, magically attract the viewer. IML Étiquettes/IML Labels is a highly specializedand well established label supplier in North America with high IML competence.IML Étiquettes/IML Labels summarizes his own expertise as follows: “We are the only printer in North America that specializes exclusively in IML (in-mold labeling).” Important for IML Étiquettes/IML Labels is also the environmental aspects: The IML process has minimum impact on the ecosystem and satisfies the highest environmental standards. Its components and materials, including the paints and lacquers, can be full recycled. Regular audits ensure that all the standards are observed.IML Étiquettes/IML Labels achieves 80% of its production in the foodstuffs industry where minimum residual odor and a “zero printing media migration” are demanded. The shape of the stadium cup requires labels that are stamped with the utmost precision on the one hand, and that can guarantee the fast cycle times with a good electrostatic charge on the other. The 220 lpi sheet-fed offset process guarantees the highest printing quality for both four-color photographic images and for Pantone colors. IML Étiquettes/IML Labels can print IML labels with up to 8 colors including lacquer coating. The polypropylene base films can be white, opaque, transparent, matt or glossy. They protect the packaged product effectively against cold or heat, moisture and scratches. A team of specialists supports the customer with the design and its technical implementation. This gives IML users a broad range of options to lend their products an upmarket look and feel at the point of sale in order to influence the purchasing decision.